MCT, manufactured by Midwest Cooling Technologies, is a bit of an old dog – but far from one to be dragged out into the street and shot. Like FluidXP+, it's been around for a while, at least as far as non-conductive fluids are concerned – 2004, to be exact. For those of you in the UK who aren't horribly familiar with the name, I'm not all that surprised. 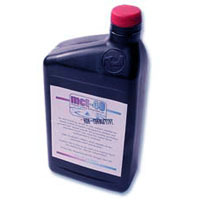 The MCT brand, at least in its computer form, is manufactured exclusively for Danger Den and finds its way to the UK only by someone also selling Danger Den products. What can I say – the EU gets Aquacomputer, we get this stuff. Oddly, the fluid hasn't changed much over its years. Unlike FluidXP+'s four product revisions in as many years, MCT has always been...well, MCT. There's been a whopping two products – MCT5 and MCT40. Both products come in a motor oil-esque packaging. The resemblance shouldn't be too surprising because Midwest Cooling Technologies also has its hand in automotive and industrial cooling applications. No wonder the stuff smells like antifreeze. MCT-40 in the test rig – note the lovely colour! Speaking of antifreeze, the look and feel of MCT-40 is quite reminiscent of it. The solution comes in only one colour – a dirty green that looks like you just drained a gallon of Prestone out of your car. It smells like it, too – I wouldn't really advise taking a big whiff, much less a mouthful. Unlike FluidXP+, this stuff is certainly not safe for pets, kids, or stupid people who'd drink it on a dare. The product is a bit more viscous than water (a hair thicker than FluidXP+ Ultra), but not so much that a pump should have too much trouble moving it. MCT-40 lists on the packaging that one of its strengths is quick bubble dispersion, which is odd considering the thicker formula – I'd expect bubbles to hang around a bit longer than other formulas. Testing yielded a very different result, though. Feser One is the new German kid on the block. The product was created in 2007 by Martin "Smoothy" Gennat, and has started gaining a lot of attention. Just a couple months ago, you could barely find it – at least here in the States. Now it's everywhere, with retailers across the US and EU hopping on board. One thing is for sure – the compound has sheer choice on its side if nothing else. It comes in more colours than you can shake a stick at, and it seems that every time you turn around, another one is released. There are options that cover the rainbow, and even some that change under UV light – for instance, the rather cool Black and UV Blue, which does just like it says on the tin. Without UV it's a deep black, but under UV light, it changes to a clear UV blue. 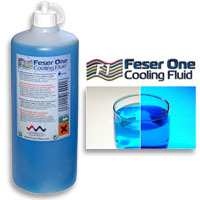 As far as consistency goes, Feser One is probably the closest to pure water. It's not very viscous, and feels more like a light alcohol running over your fingers as opposed to the oil-like MCT-40 or FluidXP+ Ultra. This could be good or bad – the good news is that bubbles should disappear quickly and fluid dynamics should be similar to water. It could also mean that, if the alcohol feeling is any indication, the cooling properties won't be quite as good as the heavier alternatives. Alcohol cooling in any real practice is largely evaporative – the opposite of what's wanted in your loop. Feser One (UV Blue) in the test loop. It gets quite a nice glow from the UV fans, though it's hard to see in the bright light of the office. Interestingly, not only is Feser One pretty new, it's also quite a bit cheaper than the alternatives. At under £8 including VAT, it's half the price of MCT-40 and less than a third of the cost of FluidXP+ Ultra. However, the old adage of 'You get what you pay for' is likely ringing through the heads of many of you right now – is it worth the hype, or just a cheaper alternative? 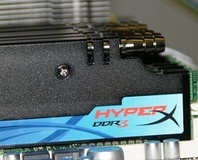 With all of the components in watercooling, one always seems to get overlooked - the radiator. So much effort goes into waterblocks that we seldom see a complete "here's the best" test. Fortunately, we're fixing that problem today, with the first in a series of radiator shoot-outs.